Yup, you read that right: Kaladesh, not Amonkhet. I still had a couple virtual boosters from that set and from Aether Revolt lying around on my account (obviously, now I have even more of them), because I did not get to draft that format quite as much as I’d wanted to, while also doing decently well in it. So I kept them until I felt like returning to that block. Today I did, after once again failing to go 3-0 in a league, although I was pretty sure I drafted reasonably well, but then met a deck that looked simply way more powerful than mine and almost certainly hailed from another draft pod. I am not sure how much the idiosyncrasies of Amonkhet are responsible, how much the nature of draft leagues is, and how much it is just random variance, but I am just not doing as well lately as I am used to in drafts, and the issue seems to lie with my decks. I never was a great player, but I am pretty sure that I do not play worse now than I did in the last few years – I actually believe I even got a little better again due to spending more time with the game. 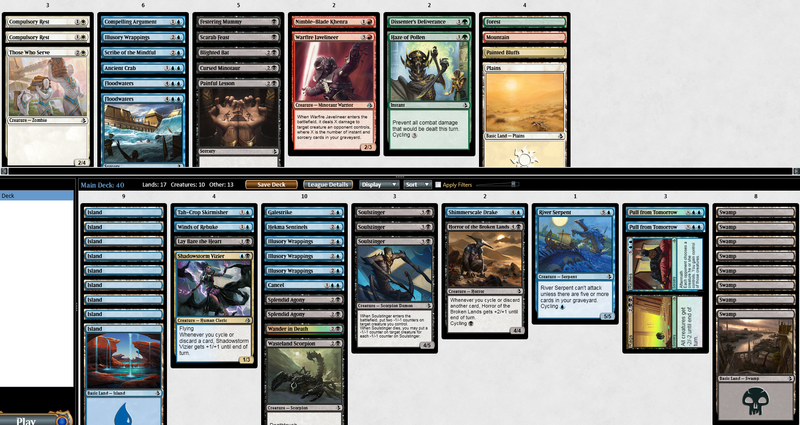 I also don’t think that I draft worse. My decks just do not come together quite like they should, and my opponents always seem to have better decks than they should if they drafted in the same pod as I. 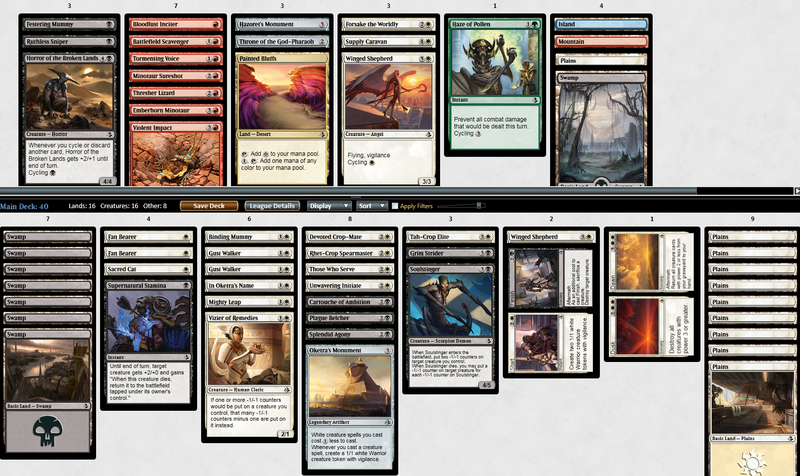 So, today felt like the right time to give Kaladesh block draft a farewell, and also to do a pod draft once again. 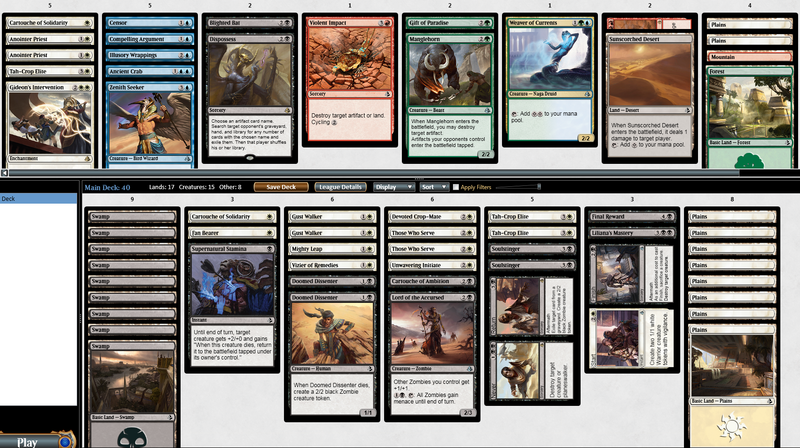 Of course, I convincingly 3-0ed my pod, which succinctly proves that pod draft rewards skill more than league draft does! On a more earnest note, my impression that Kaladesh block had actually been a little faster than Amonkhet draft was reinforced (and it’s still just a medium fast format). I firstpicked Liliana’s Mastery, followed it up with Fan Bearer, and then somehow stubbornly forced Orzhov zombies, ignoring that Blue was wide open for me, counting on my persistence to pay off during the second half of the draft – which it did, although not quite as much as I had hoped for, but I got a Gust Walker and the Final Reward pretty late. I realize the irony that, when finally getting those clear signals I had been missing in earlier drafts and complaining about it, I did not heed them, but I weighed the power of my early picks and the quality I would likely get in those colors during the rest of the packs against the likely rewards of switching to Blue, and at any point of the draft it seemed to me that I would likely still end up with a stronger deck if I stayed on course, carried by the high power level of my early black picks, the amounting mass of my playable white picks, the expection to push another drafter or two further down the table out of my colors by completely blocking them, and the strong synergies between Black and White in Amonkhet draft. Two observations: My games took long or even extremely long to finish again, no matter what I played against; and this was the third time out of three that I went 3-0 playing Black. While with this sample size, one obviously cannot infer anything definite from the fact, I do believe that Black is just a good color to be in when aggressive decks are still overdrafted. I’m aware that posting screenshots of decks that won a draft (or, more precisely, went 3-0 in a draft league) is one of the cheapest ways to produce content for a Magic blog, but that’s just why I do it – the alternative at the moment would be to stop posting altogether. I think this was my 9th Amonkhet draft overall, and I’ve yet to draft one deck that turns out the way I want it too. I’m not sure what happened to signalling, but I never get a clear impression of the colors open for me until it is too late – if at all. I find that very strange – shouldn’t leagues incentivize players to signal more clearly than in pods, because hate picks have less value? Be that as it may, I have now achieved my 2nd 3-0 result, and this time with a deck that I would categorize as aggro, although a bit on the slower side of that strategy. I found myself unable to decide between Orzhov and Boros until the middle of pack two, and I did not manage to get more than just a few zombie synergies. Although they were technically aggro mirrors, none of those matchups made for really fast games, especially not the ones where I went for the Sniper strategy (not that I ever got to use its ability – I think I drew it only once and then without cycling cards). While I beat my finals opponent in three games, I was also close to winning against him on time. Dusk / Dawn, which is a great card in many matchups, was extremely disappointing this time. I sideboarded it out every match. The card which felt most powerful to me was Oketra’s Monument – it seems really hard to lose if you play it on turn three with a few creatures in your hand, and I didn’t. Let me, for the umptieth time, reiterate this truth about draft environments: Being curve-conscious and tempo-based is not the same as being fast. I just don’t see it. I mean, I hear it everywhere, and I read it everywhere, but I just do not see it: Amonkhet draft being fast. It just isn’t. I admit that may personal experience with this format sums up to a meager four draft leagues. But in addition to that, I watched about a dozen draft videos, and several additional hours of draft streaming. I watched a lot of coverage from GP Richmond, and all of the draft coverage from PT Amonkhet. I looked at the top 8 deck lists of all three Amonkhet limited Grand Prixs on that weekend, and at the collected 3-0 deck lists from the first draft round of GP Bologna. I read the features about successful drafters in all those coverages. I took an especially close look at Frank Karsten’s list of most-played commons in day 1’s draft. Oh, and I also always take notice of the screenshots of winning draft decks which players like Andreas Reling post in my timeline. And I do not see a fast format. 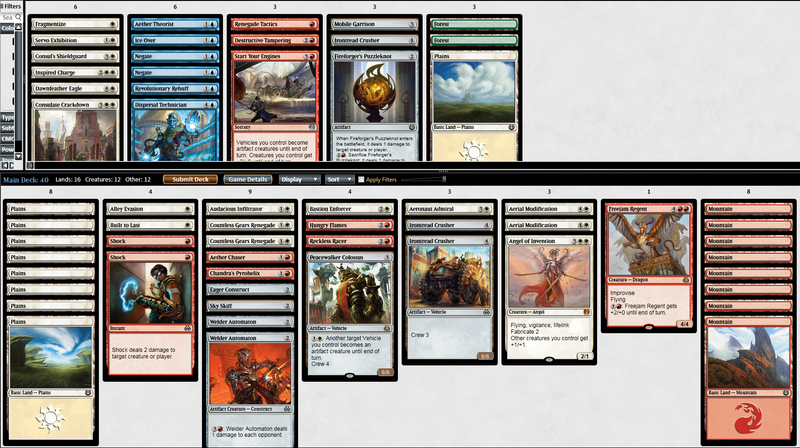 There is a heck of a lot of midrange decks, some controllish builds and some aggro. Creatures with exert heavily encourage you to attack, and players have begun to figure out that giving haste or vigilance to or untapping those creatures is powerful. But the games still go long, often even very long. And aggro is by no means king of the format if you just look at the results. It can be good, but it is not as good as people were led to believe during the first weeks, when Red was an underdrafted color and removal was valued criminally lowly (both of which I witnessed shockingly often). You see, it is unlikely that draft formats will ever return to the days when you actually could spend the first couple of turns adding nothing to the board without risking to get overrun by an opponent who curved out. That is not the measurement of a slow draft format today. So forget the silly mantra that every new draft format is “great” in its first week, but “tempobased” after that. All formats are tempobased (and that is an important aspect of making them great)! Being slow or fast is about the number of lategame cards you can get away with running, not about a guaranteed number of turns you can survive while playing goldfish. Done with my rant, I will now present you with my first winning Amonkhet draft deck after three failed attempts with a 2-1 score. I neither forced those colors nor that strategy, I just happened to end up there; and I do not even think that this is an especially great example of U/B control, but it did the trick.